STATEIMPACT PENNSYLVANIA – The Pennsylvania Department of Environmental Protection says Energy Transfer hasn’t complied with an order related to the recent explosion of the Revolution pipeline outside Pittsburgh, so it has halted reviews of new water crossing permits the company wants for its natural gas liquids lines Mariner East 2 and 2x. Energy Transfer is the parent company of Sunoco Pipeline, which built the Revolution line and the 350-mile long Mariner East pipelines. The Revolution pipeline will also remain out of service until the company meets DEP’s conditions, the agency said Friday. In September, heavy rains caused a landslide, resulting in an explosion that destroyed a house in Center Township, Beaver County. DEP’s investigation found the company had violated permit obligations, which included unreported landslides and erosion into nearby streams. DEP executive deputy secretary Ramez Ziadeh wrote to Sunoco that it had failed to comply with the agency’s order issued in October. DEP says further investigations by DEP inspectors, most recently in January, uncovered continued violations of Energy Transfer’s erosion and sedimentation permits, a violation of the state’s Clean Streams Law. Gov. Tom Wolf called for the Legislature to enact pipeline reforms, and asked the Public Utility Commission to step up its oversight of Energy Transfer/Sunoco’s Mariner East pipeline project. 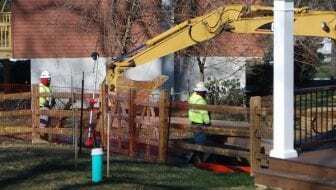 The company has 27 Mariner East 2 permits under review, most of which are related to pending construction in Chester County, where pipeline work caused dangerous sinkholes that exposed the natural gas liquids line Mariner East 1. That line is not operating pending review by the Public Utility Commission. Mariner East 2 continues to ship product using a 12-inch work-around-line, and this order does not halt its operation. Lisa Dillinger, a spokeswoman for Energy Transfer, said the company has told the DEP and the governor’s office that it’s committed to complying with all of its permits and state regulations. The Mariner East project has been plagued by mishaps and delays caused by drilling mud spills and sinkholes. The DEP has halted construction at times, issued more than 80 violations, and penalized the company $12.6 million for permit violations. The explosion in September on the Revolution pipeline created more fear among residents who live close to the company’s Mariner East lines, especially in Chester County where sinkholes have exposed Mariner East 1. Residents of Chester County have been especially vocal in urging Wolf to take action. Chester County District Attorney Tom Hogan has opened a criminal investigation into the company’s practices. Wolf has directed the Pennsylvania Emergency Management Agency to step in and assist local governments with emergency plans. The governor’s deputy chief of staff Sam Robinson says the PUC needs to take more “aggressive” action toward the company. The PUC said it is reviewing Wolf’s comments before responding. Energy Transfer’s spokeswoman Lisa Dillinger defended the company’s record on communication. She says the company hosted more than 700 township meetings, conducted sessions with 2,342 emergency responders and held emergency preparedness meetings with 36 schools in 17 counties. Gov. Wolf urged lawmakers to pass a set of rules that would grant siting authority to the PUC, require companies to provide emergency information to schools within 1,000 feet of a pipeline, force pipeline operators to meet with emergency managers to develop evacuation plans, and mandate installation of automatic shut-off valves in highly population areas. The pipeline safety group Del-Chesco United released a statement calling the DEP’s action Friday “a good start,” but said Wolf should go further.